Nineteenth-century artist Benjamin Waterhouse Hawkins still influences how prehistoric life is represented today. Hawkins’s design for New York’s Paleozoic Museum, a project that was closed down by the city’s infamous politician William “Boss” Tweed. Reconstructed skeletons of dinosaurs and life-size models of how they may once have appeared are now commonplace. But until the British artist Benjamin Waterhouse Hawkins created such things in the second half of the nineteenth century, dinosaurs and their kin were poorly understood and of little interest to anyone but a handful of professional paleontologists. Hawkins was responsible for designing public displays both in Great Britain and in the United States depicting prehistoric life; he also produced a wealth of drawings, paintings, and lithographs to illustrate the publications of such influential figures as Charles Darwin and Thomas Huxley. Indeed, no other artist had direct involvement with so many of the leading scientific lights of that seminal period. Yet Hawkins, who changed forever the way people thought of time and the history of life on Earth, never came to believe in evolution. for the first time to illustrate and realise—the revivifying of the ancient world—to call up from the abyss of time and from the depths of the earth, those vast forms and gigantic beasts which the Almighty Creator designed with fitness to inhabit and precede us in possession of this part of the earth called Great Britain. With scientific guidance from Richard Owen, the eminent comparative anatomist and paleontologist who was head of natural history collections at the British Museum, Hawkins went about his re-creation of the prehistoric world with typical diligence, carefully researching the current understanding of geology, stratigraphy, geography, and paleontology. Since the end of the eighteenth century, fossil finds in Great Britain and elsewhere in Europe had stimulated thinking about prehistoric life on Earth. Discoveries by naturalists and collectors had provided tangible evidence that large reptiles once roamed the oceans and shorelines of a “pre-Adamite” world. In 1821, British paleontologist Gideon Mantell and his wife, Mary Ann, discovered the fossil teeth of a large reptile in Sussex. Mantell eventually named the creature from which the teeth had come Iguanodon because of a similarity between the fossil teeth and those found in living iguanas. Hawkins stands beneath the skeleton of Hadrosaurus foulkii. The articulated mount, prepared by Hawkins for the Academy of Natural Sciences in Philadelphia in 1868, set the standard for exhibiting fossil bones. 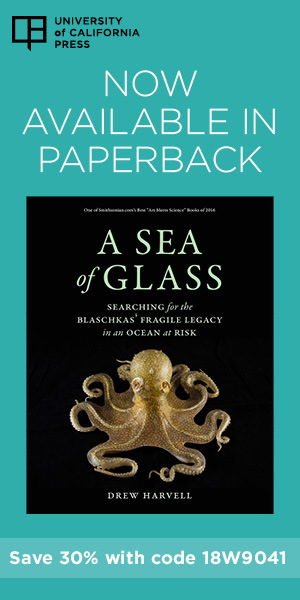 Over the next few decades, as other fossils were discovered, scientists began to acknowledge that they might represent newfound classes of ancient creatures whose existence had previously been unknown. In a paper published by the British Association for the Advancement of Science in 1842, Owen proposed assigning the name Dinosauria, or “terrible lizards” (from the Greek deinos—terrible—and sauros—lizard), to three of the terrestrial finds. Some of these models contained 30 tons of clay, which had to be supported on four legs, as their natural history characteristics would not allow of my having recourse to any of the expedients for support allowed to sculptors in an ordinary case. I could have no trees, nor rocks, nor foliage to support those great bodies, which, to be natural, must be built fairly on their four legs. 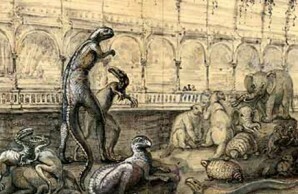 In the instance of the Iguanodon [it] is not less than building a house upon four columns, as the quantities of material of which the standing Iguanodon is composed, consist of 4 iron columns 9 feet long by 7 inches diameter, 600 bricks, 650 5-inch half-round drain tiles, 900 plain tiles, 38 casks of cement, 90 casks of broken stone, making a total of 640 bushels of artificial stone. These, with 100 feet of iron hooping and 20 feet of cube inch bar, constitute the bones, sinews, and muscles of this large model, the largest of which there is any record of a casting being made. While the accuracy of Hawkins’s reconstructions could—and would—be debated among the scientific cognoscenti, the life-size antediluvian monsters made an enormous impression upon the many people who saw them. Millions of visitors flocked to the Crystal Palace and its beautiful grounds after the exhibition was opened by Queen Victoria in June 1854. Forty thousand people attended the opening ceremonies alone. 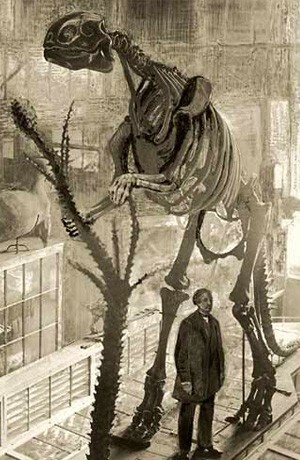 Hawkins’s work at Sydenham firmly established his reputation: no one else had ever combined an artistic interpretation of the fossil evidence with the complex engineering skills needed to reconstruct such colossal creatures on a life-size scale. 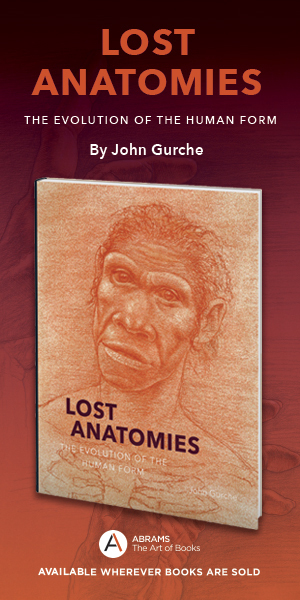 Inevitably, in a fast-emerging field such as paleontology, new discoveries and interpretations would soon reveal errors in Hawkins’s speculative reconstructions. But whatever criticisms were leveled at the sculptures were really thinly veiled attacks on Richard Owen, whose imperious personality and conservative (and later, anti-evolutionary) views made him a popular target for younger scientists. Such critiques did little to diminish Hawkins’s achievement. While a small number of scholarly publications had been discussing and even illustrating “deep time” for a century or more, it was Hawkins’s installations that brought the concept into the open and began to prepare the public for the contentious debates about evolution that were to emerge within just a few years.